The first mass-produced Christmas Card was printed in 1843 when the founder of the Victoria and Albert Museum commissioned John Calcott Horsley to paint a festive image to accompany a message of season’s greetings. If you are curious the image can be found on Wikimedia Commons here. The image gained much criticism for depicting children drinking wine. Nevertheless, the idea caught on and Christmas Cards became a fashionable way to send best wishes to friends and family for the holidays and the new year. Americans, however, had to import Christmas cards for thirty years. In 1875 Louis Prang, a German immigrant to the US, began the first mass-produced Christmas cards for sale to the domestic market. Above is one of my favourite Louis Prang Christmas cards. 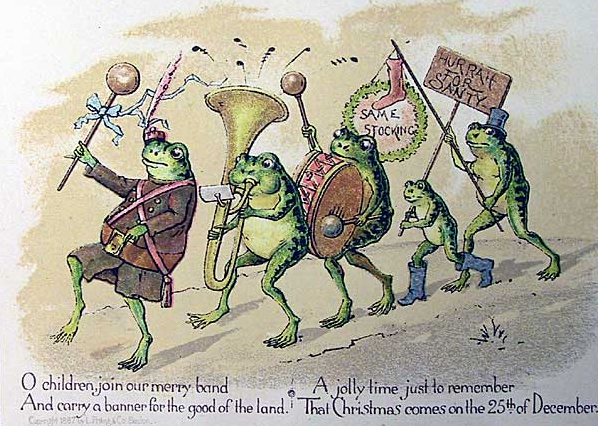 You can find a nice account of the history of Christmas cards here if you are looking for a bit more information. Pue’s Occurrences would like to thank all of our readers for their support over the last year. We would like to wish everyone a Happy Chistmas and a prosperous New Year. 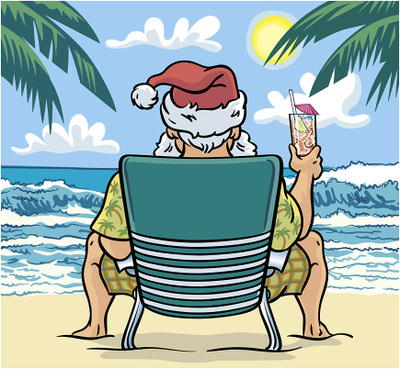 We are taking a break for Christmas and will resume our regular posting schedule on 3 January 2011. Tags:Happy Christmas from all at Pue's! Just a quick reminder that our Christmas drinks are TONIGHT, from 5 pm in the Lord Edward Pub on Lord Edward Street, Dublin. We’re gathering to share a bit of festive cheer, meet and chat with our dedicated readers, and generally celebrate the holiday season. Hope to see you all there! Last month, I decided to take a little holiday to Australia to celebrate the submission of my manuscript and to coincide with a significant event in a friend’s life (to be celebrated, naturally, in Australia). My all-too-brief trip took me from sunny Sydney to the vineyards and breathtaking views along the Great Ocean Road in Victoria to Melbourne city – the so-called ‘Paris of Australia’. Although the purpose of my trip was as far from academic as possible, I couldn’t resist paying a little visit to the State Library of Victoria in central Melbourne. 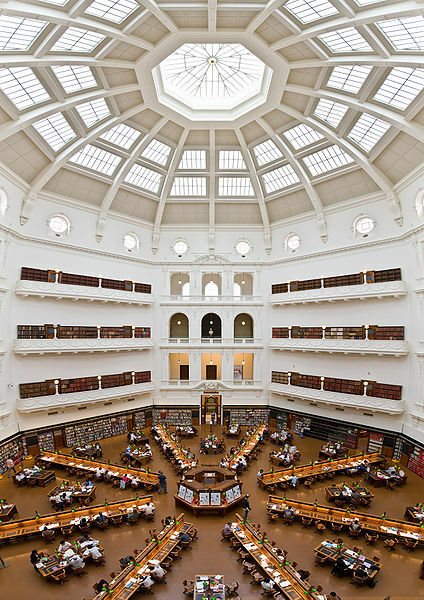 An impressive colonial building with reading rooms to rival the best I’ve ever seen, the State Library of Victoria is open to the public, allowing interested tourists like me free access to the library building, its Dome viewing platform, free exhibitions, and even some of its holdings. Ok, we’ll admit that Christmas is still more than two-and-a-half weeks away, but for occasions like this you can’t be too careful in your planning (i.e. we made our decision, with no little enthusiasm, at our meeting in early November). On Friday 17 December, the editors of Pue’s Occurrences will be upstairs in the Lord Edward pub on Dublin’s Lord Edward street from 17.00 (5 p.m. for those of us without digital watches), and we’d love you to join us for a pre-Christmas drink. It’s our chance to thank you in person for reading, for commenting and contributing, to meet some of you for the first time, to see some of you again, but most of all just to have a bit of banter to ward off the biting wind/snow/frost/recession/IMF/EU/general political malaise (insert as mood takes you). Juliana Adelman I was in London a few weeks ago and lucky enough to spend some time in the Wellcome Collection which houses the anthropological and medical collections of Sir Henry Wellcome as well as changing exhibitions on contemporary biomedical science. Free and well worth a visit. Wellcome also maintains an absolutely first class website where you can search for images (as well as the usual documents and books). I am way behind the curve in finally picking up Kate Summerscale’s The Suspicions of Mr Whicher. My only regret is that I didn’t save it until Christmas: perfect fireside reading. Ok, since I have already mentioned the ‘C’ word I might as well go with it. My favourite part of Christmas is cooking and so I was really excited to find this quirky blog by Julia Skinner which is based on modernizing recipes from a 17th C book of household management. Wet suckets anyone? Lisa Marie Griffith I was trapped in Edinburgh for last week and in between my daily trips to the airport to have my flight cancelled I managed to get some sightseeing done so all of my recommendations this month come from there. I visited the Real Mary King’s Close, just off the Royal Mile, last Monday and would thoroughly recommend it. This is a guided tour of seventeenth century streets and houses which are remarkably still standing and navigable underneath the city. The guide, dressed appropriately in seventeenth century costume, enthusiastically re-created life and living conditions for those who would have lived in the rooms whether they were lower, middle or upper class inhabitants. I also made it around the corner to the Writer’s Museum which, unlike our own, is free and open to all. The museum is worth a visit for a look at this beautiful and unusual building known as Lady Stair’s house. While the exhibition focuses on just three Scottish writers, Robert Burns, Sir Walter Scott and Robert Louis Stevenson (as well as an exhibit about Scottish PEN– the world wide international association for writers) it is well worth a look and I picked up lots of books to stuff in my hand luggage on the way home. Thankfully Ryanair did not check the weight of my bag! 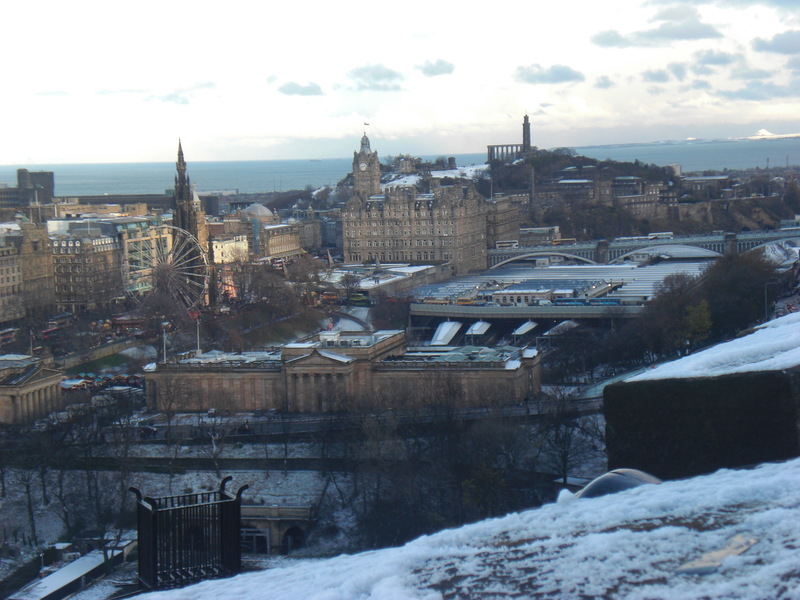 While lots of things were shut for the snow (including Holyrood Palace unfortunately) I did manage to make it to Edinburgh Castle which was free and open all last weekend and absolutely beautiful in the snow. The view from the top was truly superb! Christina Morin I managed to be away on holiday for last week’s snowfall -luckily, some would say. Being from New Hampshire, however, and a fan of such snow, I’m hoping the weather will continue over December. 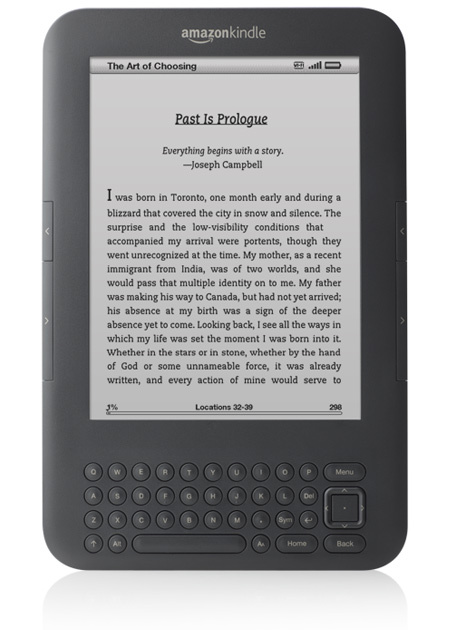 It’s perfect, I think, for curling up in front of a roaring fire with a cup of hot tea and my new Kindle. A birthday present from my thoughtful hubby, the Kindle has been a rather unexpected delight already. Although I’m sure it will never replace the “real” thing, the Kindle has proven a handy little gadget, especially whilst on holiday – no lugging loads of paperbacks in my suitcase, access to the internet where there’s free wi-fi, and only a few teething problems so far as I’ve been able to tell. Over Christmas, I’m looking forward to rounding out my post-Christmas-dinner satisfaction with a few of my childhood favourites – L.M. Montgomery’s Anne of Green Gables series. That’s one of the great things about the Kindle for fans of eighteenth- and nineteenth-century texts – they’re substantially cheaper than more recent titles. A bargain well-suited to today’s recessecionary times! Kevin O’Sullivan It came as a surprise to read last week that Come Here to Me! 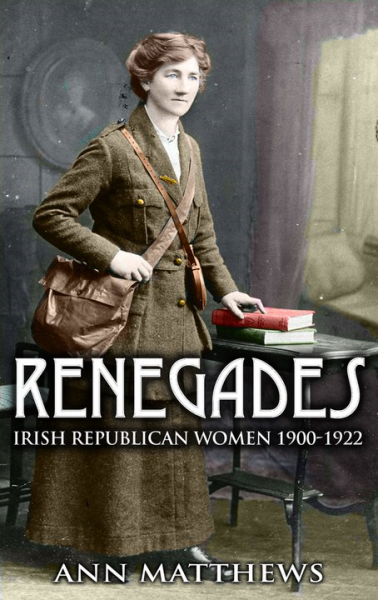 had only reached its first birthday – it seems like that their mix of history, football, music and stories from Dublin’s streets has been around a lot longer. Something that has been around a long time, but for some reason has popped up three times on a variety of television channels over the last month, is The Day of the Jackal, the 1973 film about an attempted assassination of Charles de Gaulle, based on Freddie Forsyth’s novel of the same name. I’ve no idea whether it’s historically accurate or not, but with such a cracking storyline, who cares? For the weather that’s in it, Sara Wheeler’s The Magnetic North: Notes from the Arctic Circle (which I may have recommended here before) is a superb read: part travelogue, part history, and excellent throughout. Finally, over the last month I’ve been watching bits of the new series, Reeling in the Years: The 2000s, on RTÉ 1. It’s too soon, of course, but no less compelling as an example of how history reflects the times it’s written in.